This is why I cringe at some of the commentary surrounding Beyonce's pregnancies. She may be the greatest female performer to ever do it, the Queen, Jay Z's wife, and filthy rich; but she is still a woman. When her pregnancy with Blue was announced I was all over it. I mean, I am probably one of the biggest Jay Z fans you'll ever meet. I've listened to him rap about wanting children for years, and years. So, one could understand my excitement in knowing he was going to be a dad. I blogged every step of that pregnancy, and the delivery of Blue. It was beautiful. I watched people celebrate with her, and I joined in. Even in all of the excitement surrounding the power couple's first child together, I could smell the rumors right away. I saw loads of comments flood my feed. I can sum them up like this; Beyonce... BEYONCE was too Beyonce to have actually carried a human being. She was too Beyonce and obviously not enough woman to have birthed her own child. I watched as the numerous stories of a surrogate, In Vitro Fertilization, and the illuminati circulated the web and my social media feeds like plagues. Beyonce and Jay Z were celebrating being historic, rich, young, black, married, and now parents; the rest of the world was questioning her womb. Just after Blue was born Jay released an ode to her in the form of a beautiful song entitled, "Glory". The song let us listeners in on the real story behind Blue's conception and birth. Jay speaks on the happiness and responsibility he felt as a new dad, but also the tragedy of miscarriage. He hints to the fear of even having one with Blue, but she pulled through. Soon after a documentary featuring Beyonce herself let fans in on the heart wrenching reality of the couples fertility issues. I ached for Jay, but mostly for Beyonce. Here she was having almost every material thing at her fingertips..but missing something so precious. Here she was having secretly endured some of the most terrifying realities she could imagine, and once the glory of pregnancy was upon her, the world questioned it. Even after Blue's arrival the stories continued. Was she carried by a surrogate? Is she even real? Did they create her in a test tube? I mean, the commentary has been extraordinarily evil. Masked in conspiracy theories and blinded by egos, many people attacked Beyonce and her pregnancy day in and out. That era stuck with me. It changed me as a blogger. It changed me as a fan. It changed me as a person. I hid excitement about potential pregnancies time and time again. I made a note to never comment on whether I thought Beyonce was pregnant. I remember knowing for sure that another celebrity was pregnant. I had the tea, and therefore the opportunity to break the story first..yet I refused to do so. Watching people stoop so low with Beyonce, hearing her & Jay's tragic stories of suffering through miscarriage, watching a close family member deal with a miscarriage; I became sensitive. Before Blue, the media thought Beyonce was pregnant every day. In hindsight my heart broke at the idea of her actually living with the reality of miscarriage while every media outlet is posting about her being pregnant. I decided to not ever do that. Early this year I had a strong knowing that Bey was pregnant again, but I held true to my commitment to not tweet it, blog it, or IG it. Even knowing Bey would probably never see it.. I didnt want to take the chance of offending her. 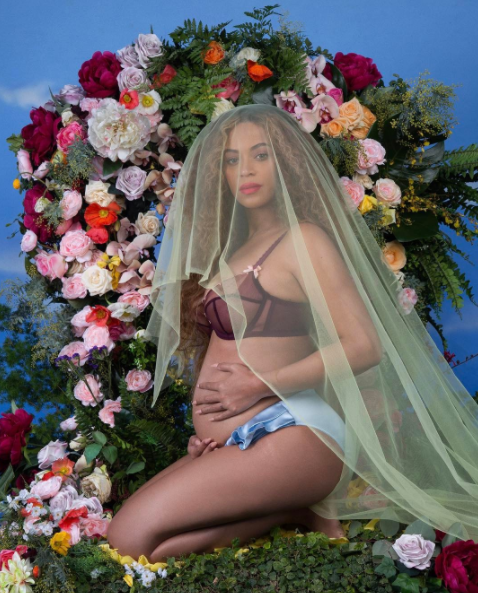 February 1st to everybody's surprise (save mine) Beyonce posted her bump on her personal Instagram page along with a special message to fans that the Carter family is growing by not one, but TWO babies! My heart leaped along with so many other people. Bey fans and non fans alike glowed with the reality of two new babies from Jay and Bey. The internet went crazy. The next day Bey shared more personal photos in a beautiful tribute to motherhood on her website. I was foolishly hoping the conspiracy theorists, bitter people, anti Beyonce people would allow for the excitement and beauty of this moment to live without spreading their venom all over our time lines; of course they did not. As if we didn't hear the heartbreaking struggles the Carters faced the first go round, here the negative nancys were again with the same hurtful commentary. "Is she really pregnant? How is she having twins? Was she using a surrogate? I bet it was IVF, Oh nooow she's pregnant for real?".... The unwarranted commentary is relentless. All the while Im sitting back wondering what would cause humans to be so cruel. I don't claim to be much, but my womanhood means so much to me. People willing to create or continue stories that Beyonce is incapable of carrying her own child were immediately removed from my feed. How much more insensitive can one get, to question a woman's pregnancy who has shared her fertility struggles with the world? Who even knows how many times she has tried prior to these twins! I don't actually care about the details surrounding her pregnancies. Whether she conceived through an intimate moment with her husband, IVF, or even if one day they decided to adopt...it's not important to me. Women every day are struggling to create or carry a child. Every day doctors are using modern medicine to allow families the chance to grow. Every day women are taking in other children to raise as their own. If these hows are your focus, you have sadly missed the most beautiful of whys and whats. The reality is that Beyonce is a super wealthy and popular WOMAN. One whose womb has not been prepared every single time to bring forth life. She is like many other women who have walked in her shoes- fortunate and brave enough to try again. She's blessed with more money and resources, but I doubt the pain and even shame is any different. These women dont need us clocking their pregnancies, commenting on unconfirmed pregnancies, holding it over their heads, discounting their wombs, questioning their maternal abilities, or in Bey's case bringing up some played illuminati story you got from youtube. This is truly a subject that requires endless sensitivity and wisdom. This isn't about her being Beyonce. You can hate her artistry, and respect her womanhood. You can disagree with her entire career, but if you can't have heart in her hurt I question your character. She may be the greatest to ever do it to some, but when she goes home at night.. she's still a mom.. a wife.. a woman...just like many other women in America. Let's leave her womb alone.